Is your business Brexit ready? If not, we can help……. We’ve just launched a bespoke research and consultancy service to prepare businesses for Brexit. Carrying out market analysis is integral for companies to navigate Brexit. 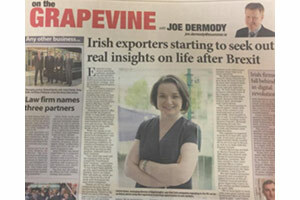 The latest quarterly business monitor from cross-border business development agency InterTrade Ireland reveals that 95% of companies still do not have a formal plan on how to deal with Brexit. Clients of Enterprise Ireland are being urged to take up the Government agency’s Be Prepared Grant. This offers up to €5,000 in support for SMEs who would benefit from research and an independent unbiased view of their business from a research specialist. “EI’s recently launched Be Prepared Grant allows Irish companies, to engage with market research specialists such as ourselves, to help investigate the feasibility of entering into new markets. To find out more call us on 021-437 4240 or drop us an email to: info@real-insights.com We’d be only delighted to help you navigate Brexit and look at other opportunities for your business to grow and scale!